Prepare for a future in finance by pursuing a bachelor’s or associate’s degree in accounting as an on-campus student or as an online degree-seeking student. 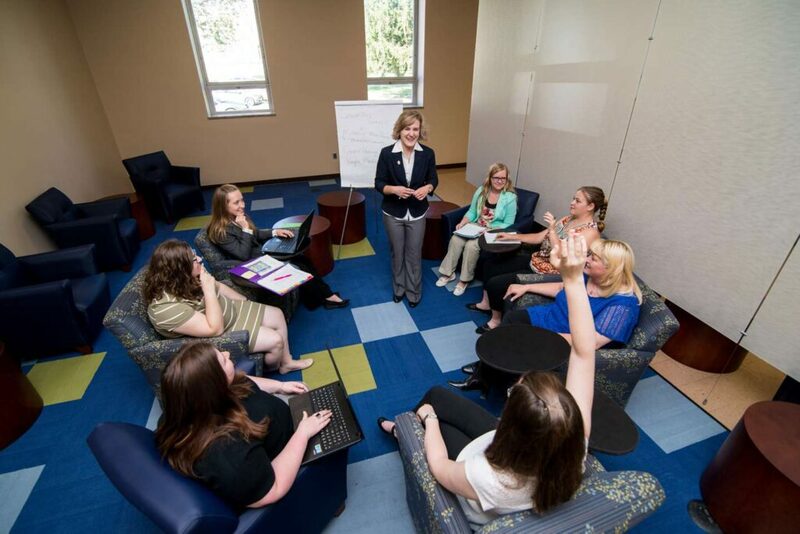 Whether on campus or online, an accounting degree at SMWC will provide you with the knowledge and skills you need for a rewarding career. Through core accounting courses, you will learn important principles to apply on-the-job. A solid foundation rooted in liberal arts education provided by our general studies requirements will help you understand operations and adapt to the changing needs of organizations. In addition to Woods Core requirements, the accounting major requires the completion of 51 credit hours of accounting and related coursework – through either on-campus or online courses. The total number of credit hours required for graduation is 125. Accounting students can choose a concentration: entrepreneurship or professional prep. 27 credit hours required; all courses listed. Studies accounting for corporations and introduces accounting for management decision making. Builds on the concepts of BU 121. Campus: Spring, every year; WOL: October, March. Prerequisite: BU 121. Surveys the various internal forces in social and business organizations from an economic viewpoint. Specific emphasis is on the relationship between a firm’s possible form and its interaction with the consumer. Campus: Spring, every year; WOL: October, March. Studies and applies communication theory and communication as a management tool. Camupus: Spring, every year; WOL: October and January. Develops a basic understanding of the methods of securing and allocating financial resources within a firm. Emphasis is on financial decision making and the associated knowledge, principles and techniques. Campus: Fall, every year; WOL: October, January. Prerequisites: BU 122. Involves the use of the case method, wherein the skills learned in accounting, finance, management and marketing fields are used to analyze situations dealing with the cultural and governmental factors that influence the environment of international business. Campus: Spring, every year; WOL: August, January. Prerequisite: Senior standing in business. 24 credit hours required; all courses listed. The course is designed in a case-based, problem-solving approach to provide a learning environment for students to use advanced features of Excel and other programs to provide financial information to a user. It includes analyzing data, interpreting data, and communicating information. It moves beyond the basic “point and click” and challenges you to use critical thinking and analysis to find efficient and effective solutions. Campus: Spring, odd years; WOL: January. The students are introduced to tax accounting for individuals by working as a member of SMWC VITA site. After completing VITA training and testing, students work with taxpayers to file their returns. Tax software is used to produce the individual tax returns. Campus: Every spring; WOL: January. Provides an in-depth study of financial accounting. Builds on the conceptual framework introduced in BU 121 to explain and evaluate accounting procedures in detail. Reviews the accounting cycle and financial statements, including the Statement of Cash Flow, and explores a study of revenue recognition, cash and receivables, present value and inventories. Students use extensive advanced spreadsheet tools and templates, and are introduced to accounting software. Campus: Fall, odd years; WOL: August. Prerequisite: BU 122. Provides an in-depth study of financial accounting. Builds on the conceptual framework introduced in BU 323 to explain and evaluate accounting procedures in detail. Includes accounting for assets, financial instruments, leases, pensions, accounting for income tax, stockholder’s equity and earnings/share. Students are introduced to exporting financial information from various sources to a spreadsheet package for analysis. Campus: Spring, even years; WOL: October. Prerequisite: BU 323. The allocation of manufacturing costs to units produced using job order, process and standard cost systems. Emphasizes enhanced management decision making by various quantitative methods. Includes just-in-time and activity-based allocation. Campus: Fall, even years; WOL: October, May. Prerequisite: BU 122. Studies auditing concepts and standards to determine if financial statements present fairly the financial position, results of operations and changes in financial position in conformity with generally accepted accounting principles and the types of reports issued. Auditing case studies are completed. Campus: Spring, even years; WOL: March. Prerequisite: BU 122. Builds on conceptual framework introduced in Intermediate Accounting. Students work with a variety of concepts including: error analysis, revenue recognition, income tax analysis, pension analysis, and cash flow risk and analysis. Students learn to prepare and communicate reports, write clear financial notes and supporting documents. Students improve critical thinking skills by evaluating different sources of information, reconciling conflicting and ambiguous data, as well as applying rules to problems not explicitly described. Campus: Fall, even years; WOL: January. Prerequisite: BU 324. Advanced accounting reviews and adds to knowledge gained in principles and intermediate accounting. The major areas covered include the equity method, consolidations, foreign currency statements, accounting diversity and international standards, financial reporting and the SEC. Accounting majors are required to take advanced accounting to fulfill the requirements for their degree. Students need knowledge in these areas for their profession and to pas the CPA/CMA exam. Designed for the student interested in becoming more persuasive in certain situations and who may manage or participate in some aspect of the selling or marketing process. Campus: Spring, even years; WOL: March, May. Prerequisite: BU 251. Studies the processes in the personnel management system to meet human resource requirements, develop effectiveness in human resources, create a productive climate and behaviors and develop leadership and decision-making abilities to accomplish individual, organizational and societal objectives. Incorporates results of research in the behavioral sciences and stresses applications in the organizational structure. Campus: Spring, odd years; WOL: August, May. Prerequisite: BU 241. This course uses an accounting software package to teach students to set up and maintain a company, record transactions, in the general journal, sales and purchases journals and cash receipts and distributions journals. Students also learn how to reconcile various ledger accounts and generate and analyze financial statements. Campus: Fall, odd years; WOL: March, May. Prerequisite: BU 122. Work experience with firm or agency directly related to the student’s major area of study. The learning experience is structured within the College approved guidelines for the internship program. Through close supervision by the director of interns, faculty advisor and the worksite supervisor, the student works toward achieving goals outlined in the individual learning contract. Normally reserved for third and fourth year students. May be repeated with different topics. As needed. Includes taxation of corporations, partnerships, estates and trusts. Students are introduced to theoretical taxation issues as well as application of current existing tax laws. Essential for those considering the CPA exam. Prerequisite: BU 225. The course is offered to prepare students to take both sections of the Certified Management Accountant (CMA) or one section of the Certified Public Accountant (CPA) or the Enrolled Agent exam. As an exam preparation course, it is intended to bring back to mind concepts learned in earlier courses and to update for any authoritative changes since taking the earlier course. Campus: Spring, even years; WOL: March. Prerequisite: BU 423. Students receive hands-on practice in Microsoft Office (Word, Excel, Access, and PowerPoint) software. Example projects include Word announcements, newsletters, business correspondence , business reports and resumes. Excel workbooks using formulas, functions, charts, and formatting. Using Access to build databases, perform queries, and to create tables, forms and reports. PowerPoint using transitions, embedding video, creating a template and custom presentation theme. Spring, even years. Elementary introduction to statistical reasoning, including sampling, organization and presentation of data, elementary probability, statistical inference and data analysis. In particular, topics covered include: the nature of probability and statistics; organization and presentation of data; measures of central tendency, variation and position; probability; binomial, normal and t distributions; estimation and confidence intervals; hypothesis testing; z and t tests, correlation and regression, and chi-square tests; applications to the natural and social sciences, business, education, and government. Use of appropriate computer software and technology resources. Fulfills Woods Core requirement. Prerequisite: MA 105 or placement. In addition to Woods Core requirements, students seeking an associate degree in accounting must complete the following courses. A total of 33 credit hours is required for an accounting associate’s. Choose three (3) courses from the following for a total of 9 credit hours. To complete the minor, students must complete 18 credit hours of coursework. 12 credit hours required; all courses listed. Accounting is often called “the language of business” because it is an integral part of every business and industry. As an accountant, you will be at the forefront of new technologies to solve today’s problems in diverse and exciting industries. The accounting major prepares a person for a professional career in accounting including the educational components for many certifications such as Certified Management Accountant (CMA), the Certified Financial Management (CFM), the Certified Internal Auditor (CIA), and others. Some of these certifications require work experience before you can take the exam. This major does not meet the requirements for those students that wish to take the Certified Public Accounting (CPA) exam without modifying and extending the number of hours above the 125 hours required for this major. If you are interested in the CPA exam, there are ways of modifying and adding hours to this major to meet the requirements in your state.